On Saturday, July 14th at 6pm The Castle and Marietta College History & Education Departments are happy to host the special presentation “Interpreting the African American Experience” by Living Historian Cheyney McKnight in Room 124, Thomas Hall at Marietta College. 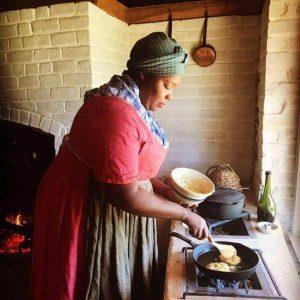 Cheyney will be discussing her experiences interpreting slavery throughout the east coast, as a hobbyist and then in a professional capacity. She will highlight the lessons she learned about interacting with the public in historical garb, and where she believes the field is headed. This event is free and open to the public. Seating is limited. About the Presenter: Cheyney McKnight is a Living Historian and Independent Scholar who consults with and aids museums and historical sites in developing specialized programming about the African American experience within 18th and 19th century America. To learn more about Cheyney’s work visit her website Not Your Momma’s History.